VOA was established in 1997 by Mr Vijay Ori. What started off as a home-based Consulting Civil Engineering business, has now expanded into the Structural Engineering and Project Management sector based in Ballito. We ensure high quality Consultancy Services adhering to ISO 9001 standards. Our professionalism places us at the forefront of Engineering excellence. With a Level 1 grading, VOA is BBBEE compliant, scoring 100 points and a recognition level of 135%. Hailing from the quaint town of Tongaat, Vijay Ori is an expert in the field of Engineering and his understanding of customer needs, as well as proficiency and foresight, ensures the Company’s sustained growth. Vijay holds a Masters Diploma in Civil Engineering and is registered as a Pr.Tech Eng. 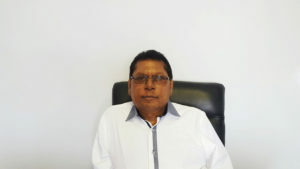 His 40 years of experience in multiple disciplines of engineering include 5 years as Deputy Town Engineer of Tongaat, 5 years in a Consulting Engineering Firm, 11 years in the Construction sector, and 19 years to date in Vijay Ori and Associates.